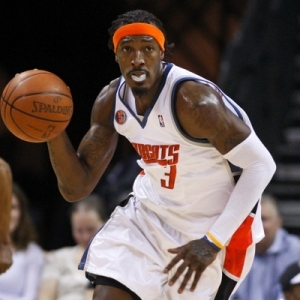 Considering the franchise we are talking about, it was a very successful 2009-10 season for the Charlotte Bobcats. After all, they won 44 games (finishing seventh in the East, fourth in the Southeast) and reached the playoffs for the first time in franchise history. There the Bobcats were no match for the Orlando Magic, getting swept pretty easily. Coach Larry Brown stressed defense and it worked: Charlotte led the league in points allowed, giving up an average of 93.8 points per game. Offense was a problem with the Bobcats finishing just 28th in the NBA in averaging 95.3 ppg. Charlotte made a pretty significant trade last November, getting Stephen Jackson from Golden State in exchange for spare pieces Raja Bell and Vladimir Radmanovic. That had to be one of the more lopsided deals in the league last season. Jackson ended up leading Charlotte in scoring at 21.1 ppg and chipped in just more than four assists and five rebounds per game. But the team’s best player remains the underrated Gerald Wallace, who made his first All-Star Team and averaged 18.2 points, a career-high 10 rebounds, 2.1 assists and 1.5 steals. He’s one of the most well-rounded small forwards in the league. For sure Charlotte has to figure out how to win on the road this season if it wants to return to the playoffs. The Bobcats had by far the fewest road wins among playoff teams last year with 13 – in fact, Charlotte’s difference in winning percentage last season at home vs. on the road was 43.9 percent, the largest in the league. Frankly, this team has taken a step backward because of salary cap issues. Yes, it did re-sign forward Tyrus Thomas to a $40 million deal after acquiring Thomas from Chicago near the deadline last season. He was OK in 25 games with the Bobcats, averaging 10.1 points, 6.1 rebounds and nearly 1.5 blocks per game. But Charlotte let starting point guard Raymond Felton walk away for nothing – he signed with the Knicks. Now the team is counting on second-year player D.J. Augustin and former lottery pick Shaun Livingston to run the team. Augustin played pretty well as a rookie but regressed and was in Brown’s doghouse last year. In addition, the Bobcats traded center Tyson Chandler, who was very limited offensively but a good defender and rebounder, for basically a pile of junk back from Dallas. The key piece back was getting center Erick Dampier and his some $13 million non-guaranteed contract. Yet instead of holding onto that potentially valuable trade piece, he was waived. Oh, and owner/president Michael Jordan clearly didn’t learn his lesson on Kwame Brown while in Washington because the Bobcats signed the former No. 1 overall pick to a one-year deal. This team will be completely dominated in the frontcourt with Boris Diaw/Thomas set to start at power forward and Nazr Mohammed at center. Yikes. The Bobcats didn’t even own a first-round pick in this year’s draft, so no help there. At least Charlotte kept Brown, who was rumored to be heading to Philadelphia (among other places). Charlotte’s ‘over/under’ win total on BetUS is 39.5. The Bobcats’ odds to reach the East Finals are +2000, +4000 to win the East and +6500 to win the NBA title. Will this team again be very good defensively? No doubt, because it has no choice. Who other than Jackson and Wallace is going to actually score? It’s like Charlotte can’t decide if it wants to be a solid, playoff fringe team or just tear it all down and start over. Because right now there is now building block on this club, not with Wallace and Jackson both getting up there in age. The Bobcats should finish ahead of Washington in the division again, but just barely. I love the ‘under’ wins, and those playoff odds are obviously not worth your time.